Home » The Worst Performing Asset Class Since Trump’s Election-Really? Following Friday’s retail sales catastrophe, interest rates plunged, and the market-based odds of further Fed rate hikes declined to just 8% in September and 48% in December. Led, of course, by begrudging Wall Street cheerleaders like Goldman Sachs’ ALWAYS wrong Chief Economist, “Hapless Hatzius.” Who, like his partners-in-crime at the Fed; and likely, its soon-to-be-new Chairman Gary Cohn – who before he was appointed Trump’s top economic advisor, was Goldman’s Chief Operating Officer; dramatically overstated the economy’s “strength” – as part of its ongoing, but rapidly collapsing “economic strength” propaganda campaign. Combining this horrific economic data with last week’s unprecedented Fed about-face; when, following weeks’ of fraudulent “hawk-speak,” Janet Yellen gave the most dovish speech imaginable; and it couldn’t be clearer that not only is “Trump-flation” dead, but any remaining “hope” of economic improvement. Consequently, as I vehemently espoused Friday, the path of least resistance for interest rates is down – until the “bond vigilantes” inevitably show up; and for Precious Metals, up. Which is why it shouldn’t surprise anyone that Friday afternoon’s COMEX COT, or Commitment of Traders report was wildly Precious Metal bullish; as quite obviously, the Cartel’s “July 4th holiday week paper smash” was enacted solely to utilize paper-thin trading conditions to further cover naked shorts. To wit, through Tuesday the 11th, the “commercials” covered an additional 33,310 gold and 14,661 silver contract shorts, bringing their cumulative short positions to their lowest levels since gold and silver’s ultimate bottoms in December 2015 – at $1,070/oz and $13.75/oz, respectively. Friday morning, I wrote that if this was indeed the case, we could be in for a significant Precious Metal rally – at a time when they have NEVER been more undervalued. And consequently, that the “historic valuation anomalies” currently witnessed in the PM sector – particularly, in silver – could dry up quickly, if one fails to act to capitalize on them. Hopefully, this morning’s rally – amidst the most PM-bullish fundamentals in memory – is indeed the beginning of the Cartel’s long-awaited, mathematically certain “end game.” To that end, gold just re-took its 50-week moving average, at $1,232/oz. Currently, the financial markets are attempting to take a “summer break.” Manipulation in thinly-traded summer markets is typically quite effective. However, this year there are too many potential “black swans” lurking to “guarantee” manipulative success. From the plunging global economy – led by the U.S., which is weakening at an alarmingly accelerating rate; to the upcoming debt ceiling debacle; and the increasingly obvious realization that none of Trump’s campaign promises are possible, the odds of plunging interest rates, Fed “hawkishness,” and Cartel effectiveness couldn’t be higher. And consequently, the odds that the “worst performing asset class since the “BrExit times ten” U.S. election – Precious Metals – rapidly recoups this historically manipulated underperformance. However, of all the unfathomably unnatural “anomalies” I have witnessed in my 28 year career, none hold a candle to the manipulative aftermath of said “BrExit times ten.” As clearly, since Trump was elected, America’s political, economic, social, and monetary outlook has dramatically weakened, to the point that the type of financial turmoil that occurred in the opening hours of his election should have yielded a significant market crash. Not due to Trump per se; but clearly, many of the ills are nation are suffering from are related to the reaction to his election; which clearly, his post-inauguration actions and policies (or lack thereof) aren’t helping one bit. 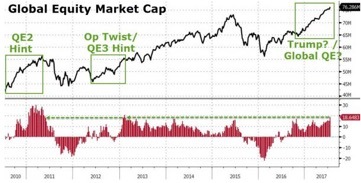 I mean, what chart screams MANIPULATION and UNSUSTAINABILITY more than the one below – of the $11 trillion of global stock wealth increases since Trump’s election; i.e., the biggest nine-month stock market capitalization increase in history? 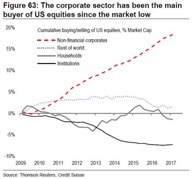 Yes, at a time when everything is going in the wrong direction – both here and overseas – “manipulation operatives” have caused financial assets to soar, when they should (and eventually will) plunge; like the NASDAQ and “Dow Jones Propaganda Average” – which have since risen by 21% and 19%, respectively. The 10-year Treasury bond yield is up from 1.85% on Election Night to 2.30% this morning – but has inexorably declined from the 2.6% high it put in four weeks later; and likely, will challenge the key psychological level of 2.0% by year-end, in my very strong opinion. The dollar index has plunged from a post-Election high of 104 to today’s level barely above 95; economic data has dramatically weakened (see this morning’s Empire State Manufacturing Index plunge); and yet, care of historic Cartel manipulation, gold and silver prices have fallen by 4% and 13%, respectively. In other words, amidst the most PiMBEEB, or Precious Metal bullish, everything-else-bearish environment imaginable, Precious Metals have been “the worst performing assets class since Trump’s Election.” Really! Which is why; particularly when one considers the aforementioned “commercial” short-covering, we may be amidst one of the best Precious Metal buying opportunities since the worldwide PM bull market commenced at the turn of the century.